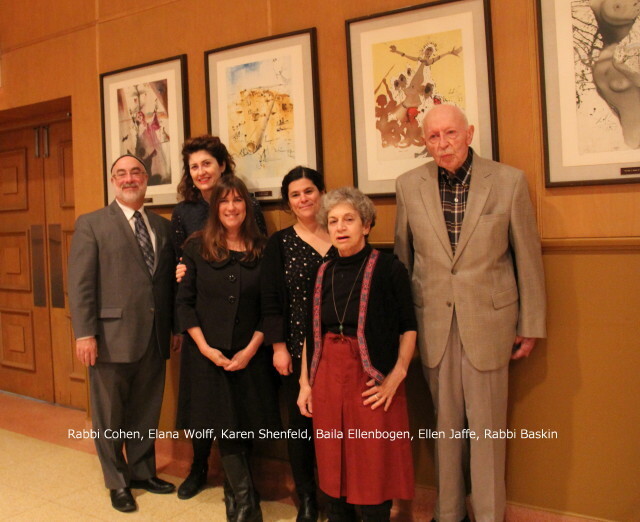 Four Jewish women poets– Karen Shenfeld, Baila Ellenbogen, Ellen S. Jaffe, and Elana Wolff– read from their Guernica collections at Temple Anshe Sholom, Hamilton, on Sunday, November 23, 2014. The attentive and appreciative “Breakfast Club” audience listened to Baila read from Footsteps on the Ceiling (2010), Ellen from Skinny-Dipping with the Muse (2014), and Karen from My Father’s Hands Spoke in Yiddish (2010). Elana presented her work on translating Georg Mordechai Langer’s Poems and Songs of Love (2014)– the Hebrew/English half of Guernica’s first-ever flipside book; the other half is The Hunger Artist & Other Stories by Franz Kafka, translated by Thor Polson. The reading was preceded by a sit-down breakfast and followed by an author/audience Q&A. We thank Rabbi Jordan Cohen and the Temple volunteers and staff for sponsoring this event, organized by Ellen, a member of the Temple. Tagged with A Hunger Artist and Other Stories; Poems and Songs of Love, Baila Ellenbogen, Elana Wolff, Ellen S. Jaffe, Footsteps on the Ceiling, Karen Shenfeld, My Father's Hands Spoke in Yiddish, Poetry, Skinny-Dipping With the Muse.